Welcome to my life Mary-Lou, you are possibly the best highlighter ever. If you are looking for the perfect highlighter to sparkle this festive season, then look no further. Hope you are having a lovely Saturday morning, last night I came home to a nice little parcel and of course I had to blog about it first thing this morning. I have seen quite a few 'The Balm' products floating about the bloghesphere but never actually tried anything. Laura from 'Buy Now Blog Later' raved about this product and did a little giveaway on IG too as it was THAT good, so of course I immediately ordered one for myself and here I am. It comes in a nice little mirror compact and holds 8.5g of product. It's a candlelit champagne shade with a beautiful shimmer without any glitter. And now let the angels sing... It's so beautiful once applied on the skin, it adds a candlelit glowing shimmer without any sparkle and has a beautiful velvet like texture that applies smoothly without being chalky or powdery. It's such a gorgeous warm champagne/vanilla shade and perfect to highlight the tops of the cheekbones or even use as an eyeshadow. I can see it working with many skin tones as it's quite light for fair skin tones yet warm enough for darker skin tones to not turn ashy. They also do several other shades too which may be great for deeper skin tones. This brand is certainly worth checking out and definitely worth the hype, and the price point is good value too, so no complaining from me. Next one my list, is the Bahama mama bronzer. 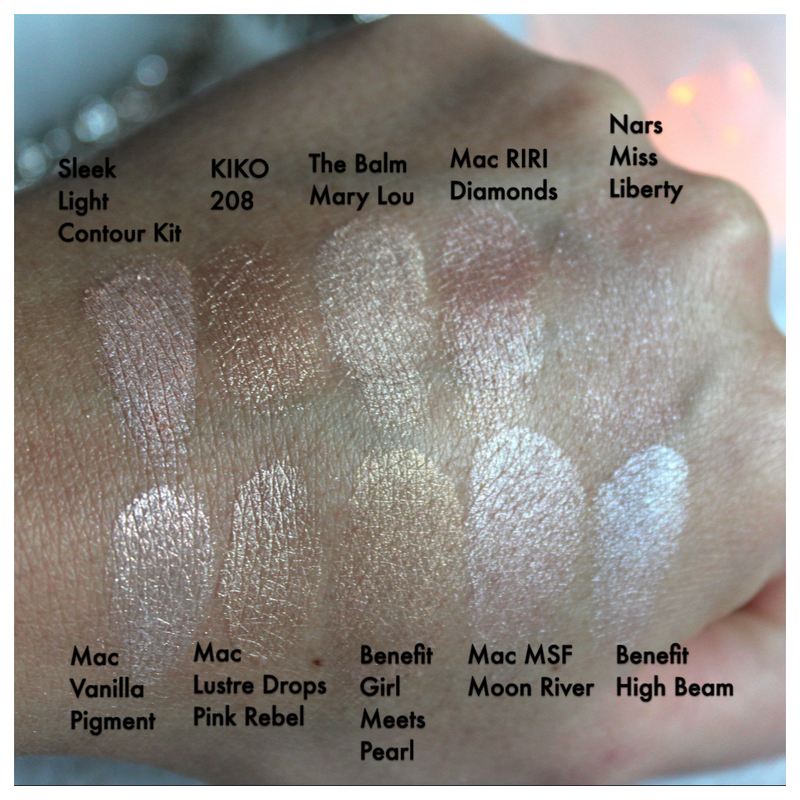 And here's a comparison with some of the other highlighters I own, as you can see it's definitely the one that stands out the most. Price £16 - Available from many online UK websites including Feel Unique, Asos, Superdug and many more. Give google a go if you are interested for the cheapest price. I ordered mine from Amazon via Beauty B a third party seller. Do you own Mary-Lou? If not, what's your favourite highlighter? Yes, I got this during the summer and it is simply stunning with a tan. I wore it again last night and it looked beautiful with my semi light tone now in the winter. Amazing swatches, now you have me adding more highlighters, love! I've had this on my wishlist forever. I love your swatches, especially the comparison with some other highlighters. I don't own this but it's something I've been wanting to pick up for forever. It's such a stunning, pigmented highlighter. absolutely love it!it lasts forever! Did you use their other products? Blushes?Bronzer? How do you compare it to Nars Albatross? @RZaoutlaw no but I have a few on my list, next I want to try the bahama mama bronzer. @Mari. - I don't own albatross anymore, but I used to have it and this is definitely smoother and more pigmented and slightly warmer.